The Dominica Labour Party (DLP) Government sparked controversy by moving to amend the island's electoral laws to make it lawful to transport electors to or within Dominica for the purposes of an election. This proposed amendment prompted a strong outcry from the Opposition United Workers Party (UWP), which deems it intolerable on the basis that it will legalise acts of bribery and treating currently outlawed by the electoral laws. The contentious proposal is to amend the Elections Act by inserting clause 57 B that reads: "For the avoidance of doubt, the transportation of electors or the facilitation of the of transportation of electors to or within Dominica for the purposes of an election does not constitute an offence unless the transportation is provided or facilitated with the intention to corruptly induce an elector to vote for a particular candidate for whom or party for which the elector would not otherwise vote." 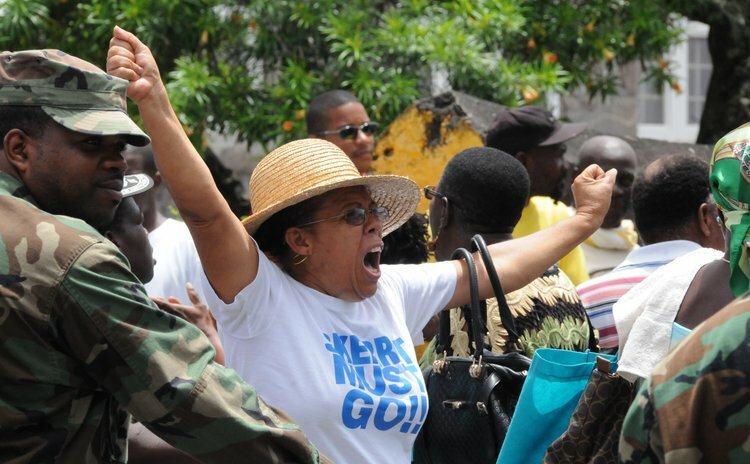 On May 23, when Bills to amend the electoral laws were to be presented in Parliament, the UWP led a public protest near the House of Assembly and, according to media reports, police fired warning shots when protesters attempted to breach barricades around the building. Following this protest, Prime Minister Roosevelt Skerrit announced that consideration of the amendment by the House would be shelved, saying: "This is the best way, I believe, for us to avoid obvious confrontation that others are seeking." UWP's Joshua Francis denounced the proposed amendment and accused the DLP of transporting persons from New York and the Caribbean to Dominica in previous elections, to vote for that party in key constituencies. Francis said his party considers this treating and bribery because the DLP bought airline tickets for such voters and gave them pocket money. "So, in essence, the attempt to amend the legislation would help. . . facilitate a practice, which has already been adopted by the DLP to get voters from the Diaspora to come to Dominica to vote. "We are of the view that any political party which would have a financial advantage would be able to transport more voters to the island, creating a distortion in the results," Francis explained. This practice is clearly bribery and treating, he insisted, adding, "It's providing a favour to an elector on the condition that he or she should vote for a political party". The UWP also contends that legalising transporting electors to Dominica opens the way for further corruption by facilitating voting by ineligible persons who did not reside in Dominica continuously for five years immediately prior to the election date. When such persons are brought back to Dominica and their names are still on the voters list, all they have to do to vote illegally is show proof of identity because they are not required to prove their continuous residency in Dominica immediately prior to elections. Francis remarked that the DLP's counter argument to the UWP position is that buying a ticket for a known supporter to come and vote for your party is not bribery or treating. But he is adamant that members of the Diaspora who wish to vote in elections must buy their own airline tickets. He added, "So we are saying for the avoidance of doubt, to remove the arguments of bribery and treating, let's make it simple. Let's clean up the voters list, let's re-register the people. And those who are interested and those who are eligible would make themselves available to be registered and would be issued a [voter's] identification card. . .
"To enhance our democracy, we need to remove any possible contamination and illegality. And we are of the view the current situation provides avenues for contamination of the electoral process," Francis said. He acknowledged that local political parties traditionally provide transportation for voters to reach polling stations. "We have no difficulty with that because the people are within the... island. But to go as far as to buy a ticket for somebody in New York, we think that is a form of political seduction." Francis acknowledged that from a purist's perspective, one can argue that the practice of providing transportation to voters to the polling station is an expansion. "And it's a fair argument except that we are concerned that practice may encourage treating and bribery and for the avoidance of doubt we want to discourage that practice." Meantime, a Commonwealth Observer Mission for the 2014 General Elections stated that the ruling party acknowledged that it paid for the return of nationals for elections. The Mission's report states that the ability of the incumbent government to pay the airline cost of potential voters "compromises the competitiveness and fairness of the electoral process, and thus ultimately represents an abuse of incumbency."